My usage of the BigSmoke.US domain didn’t get approved yet. I was hoping for a little advice to come my way by submitting an Ask Slashdot this morning, but the story didn’t get past the firehose. After realizing that I should have submitted the story to my /. journal as that would allow Slashdotters to comment without the story having to make it , I just added a journal entry. I want all the exposure and feedback that I can get. I’m still puzzled why I landed in Category 1. I distinctly remember that in March 2005, when I registered the domain, I knew I was in Category 3. Either I didn’t get a category selection then or they simply didn’t store it correctly. 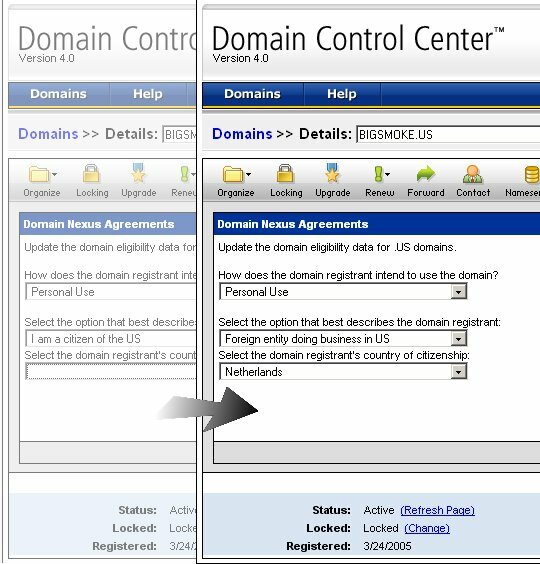 Has anyone else who registered a .US domain at Wild West Domains during that time had a similar experience? I’ve updated my domain information to reflect the actual category which applies to me (C31). The changes should be visible in WHOIS lookups soon. When I registered the domain I was aware of which category I was in, but at the time (over 2 years ago) there either mustn’t have been an option to select the category or the selection simply wasn’t saved. I would never have consciously stated that “I’m a US citizen,” because it’s simply not true. Now you apparently need some information from me before NeuStar can approve my use of the BigSmoke.US domain. I’m afraid I’m going to need a little help on this as I’m not very familiar with the legalities of .US domain regulations. I can tell you that my website is a resource for a US demographic and that it’s hosted in the US. I can easily prove that my website is hosted in the US. Would that be sufficient? I’ve pointed to the statistics which say that most of my visitors are US citizens. Also, various pages on my website are bookmarked by hundreds of people using an American social bookmark manager [http://del.icio.us/bigsmoke/www.bigsmoke.us]. Apparently, the fact that my website is of great use to Americans is of no import? Or is it just that I need to deliver more useful information about this? I want to make better my SQL knowledge. read more about SQL for my position as mysql database manager.